Dubai, UAE, May 9, 2016: Reputed Healthcare provider of the MENA Region, the Saudi German Hospitals Group, recently hosted an event in Dubai to unveil its new dedicated Plastic Surgery Center. 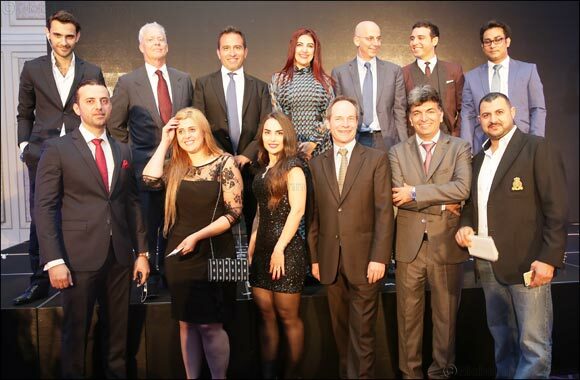 Held on the evening on the 1st of May at the Palazzo Versace Hotel, Cosmetrix as the new Center has been titled, was launched amidst a glamorous event that was attended by VIPs, celebrity guests, select members of the media, social influencers and prominent women’s associations among others. Also in attendance was the Group CEO, Dr. Reem Osman along with the team of Doctors who will be heading Cosmetrix. As guests arrived at the event, they were greeted with a drink and some melodious music courtesy of an elegant violinist following which they were seated within the ballroom that flaunted a luxuriously Venetian ambiance. The glamorous evening then began with a welcome note after which Dr. Reem was invited on stage to say a few words about the new Center that looks set to revolutionize the Plastic Surgery industry of the UAE. Subsequent to Dr. Osman’s enlightening speech about Cosmetrix, the host of the evening invited the learned Doctors of Cosmetrix, Dr. Paul Audi, Dr. Abi Abdallah Ibrahim, Dr. Francis Rogers Palmer, Dr Ibrahim Melki, Dr. Charbel Medawar on stage for an interactive Q & A session. As the session culminated, the guests were treated to some exquisite entertainment as a magician regaled them with intriguing tricks during the Gala Dinner that simultaneously commenced. Finally, prominent Syrian Bilingual Singing star Zeina Aftimos left the attendees amazed as she took to the stage for the final performance of the evening. As the evening concluded, guests departed with some beautiful memories and mementos from the event. Highly-Qualified Medical Team – Most impressive team of plastic surgeons and cosmetic specialists, supported by experienced and highly-trained clinic management and staff. Exceptional Value – Top doctors, technologies and facilities, without paying top prices. From weight loss, breast and body procedures to nose, eye, skin and other facial procedures, you can completely trust Cosmetrix to make your dream body a reality.